Galion’s Kody Brown delivers a pitch during Wednesday’s game against the Lima Locos at Heise Park. Lima defeated the Graders, 6-5, to hand Galion its seventh consecutive loss. GALION — The stress associated with a long losing streak was visible on the face of Ray Neill after his Galion Graders dropped a 6-5 decision to Lima on Wednesday at Heise Park. 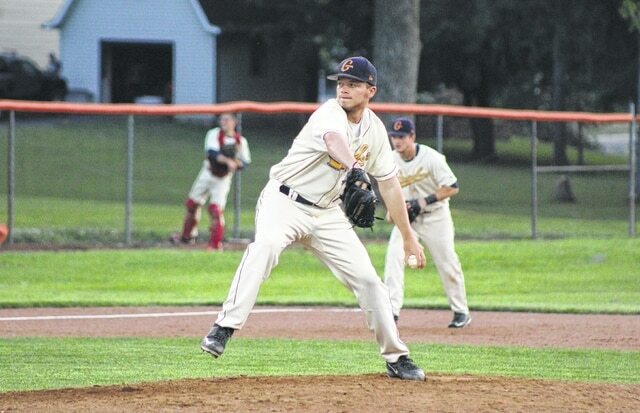 It marked the seventh consecutive defeat for Galion, which less than two weeks ago, was only three and a half games out of first place in the Great Lakes Summer Collegiate League. After Wednesday’s loss, the Graders (4-13) find themselves nine and a half games behind league-leading Hamilton (15-5). Galion grabbed a 2-0 lead in the third inning thanks to a two-run single by Nick Riotto. Tyler Ocker led off the inning with a walk and Kevin Shrock followed with a basehit to set the table for Riotto. Graders starting pitcher Matt Sullivan held Lima scoreless for five innings, scattering four hits in the process. However, the Locos (12-5) pulled even in the sixth inning after Will Kilgore and Brett Murray slapped back-to-back singles and then coordinated a double steal to move into scoring position. Kilgore scored on a Galion error and Murray came home with the tying run on a double by Henry Rowling. Mitchell Carriger hit the first of three Locos home runs in the seventh inning to put the visitors ahead, 3-2. The Graders regained the lead after Riotto drove in two more runs on a two-out single in the bottom of the seventh to put Galion on top, 4-3. Lima took the lead for good in the eighth thanks to a two-run homer by Hunter Williams and a solo shot by Nate Romans, leaving the Locos with a 6-4 edge. The Graders took advantage of the combination of a hit batter, a basehit, a wild pitch and an error by the Lima shortstop to push one run across the plate in the home half of the eighth. Alex Malinsky was the beneficiary of the odd assortment of circumstances. Zack DeThomasis was credited with the RBI on Malinsky’s run. Locos reliever Mitchell White struck out three of the four Graders he faced in the last of the ninth to earn the save, his second of the season against Galion. He finished with five strikeouts and one walk in two innings. Galion scored a run on one hit off of White. Ryan Ruggles (1-0) picked up the win in relief for Lima. He worked two innings, gave up two runs on one hit and recorded one strikeout and one walk. Carriger and Kilgore each finished 3-for-5. Rowling went 2-for-4. The homers by Williams and Romans were their only hits of the game. Lima finished with 12 hits and left eight runners on base. The Locos committed four errors. Kody Brown (0-1) took the loss for Galion despite pitching just two-thirds of an inning. He gave up two runs on one hit and walked one batter. Sullivan worked 6-2/3 innings, gave up three runs on nine hits and struck out eight batters while walking just two. Josh Peterson pitched the final inning and two-thirds, gave up one run on two hits and recorded a pair of strikeouts. Riotto and Shrock each went 2-for-3. Colton Carney, Brody Basilone and Jake Krupar each had a hit. The Graders left nine runners on base, including two each in the fifth and eighth innings, respectively. Galion also committed two errors. Galion will play a two-game series with Licking County on Thursday and Friday at Heise Park. First pitch is 7:05 p.m. each day. The Settlers (9-9), three-time defending league champions, have endured their own struggles this season. Licking County is 5-5 in its last 10 games. The Graders travel to Athens on Independence Day to face the Southern Ohio Copperheads (13-8), then play host to the Copperheads at 7:05 p.m. Sunday at Heise Park. Fireworks will follow the home game on Sunday.